I marked the quote above from Wildwood a week or more ago, and was reminded of it today when we went to the St. Louis Art Fair and saw the ethereal treescapes created by Jim C. Brown, an artist from Vancouver. I didn’t understand everything Brown said about his process, which involves photography and a thin layer of plaster, but I understood this: He told us that he photographs lone trees and collects them in a sort of travel journal. Later he combines them to create what he calls “imagined forests.” They appear as soft charcoal-colored images on the eggshell-white plaster. For some, he paints the surface beneath and then chips away portions of the plaster to reveal flashes of blue in a sky. They are enchanting, just like Deakin’s lone walnut tree near Jalal Abad. Trees are like that; they compel us to treat them with special respect. I think this is because they serve as architectural features outdoors, like cathedral columns, while retaining their own wild magic. The tree in our yard that I love most is the apple. It produced tons of fruit last year, and I made batch after batch of applesauce and one apple cake. Sadly, the tree did not blossom this spring. I am hoping that this is a cyclical thing, and that it will fruit again next year. We don’t have a walnut tree of our own here, but I know one is close by because I found a green-cased walnut on the ground outside this morning, half-gnawed by a squirrel. My own imagined forest would contain several apple and walnut trees, blue spruce, and the pecan tree from my grandmother’s house with the swing still in it. Ernesto has an imagined forest, too. Some time back he struck up a conversation at the grocery store with another shopper over the fig preserves. As I walked up, I heard Ernesto say wistfully, “I have a fig tree, but it is stuck in North Carolina.” My dad rooted the fig tree for us, but we have never taken it away because we always fly to NC. No one at either end wants to drive 15 hours for the sake of picking up or delivering a fig tree, so it grows in Ernesto’s mind and produces a fine crop of sweet figs. He also regrets the loss of the orange tree from his back yard in Florida. Before we left the art fair today we bought a pot from Jennifer Falter of Springfield, Missouri. 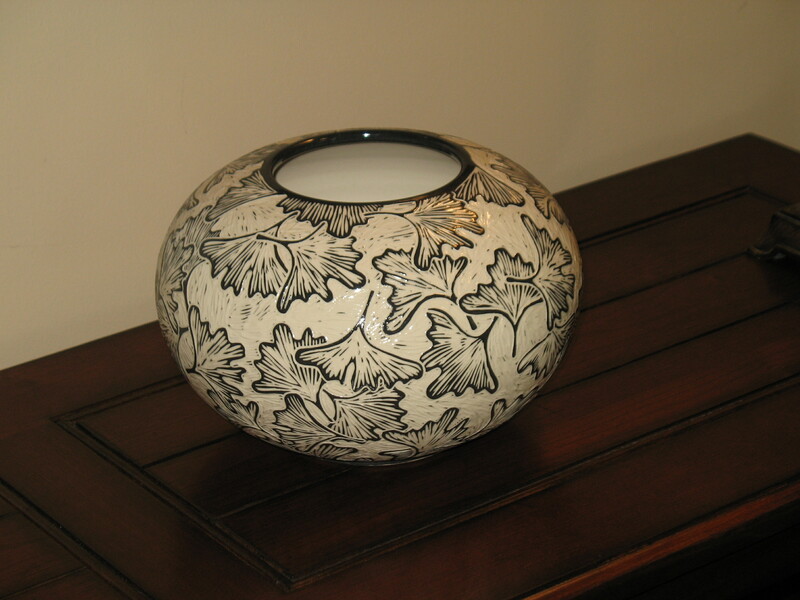 We loved the simple black-and-white carved patterns and the texture of her pottery. And in keeping with our imagined forest, it is covered with ginkgo leaves.